Edward Oldcorne was born in York, England of a non-Catholic father and a Catholic mother. He gave up medical studies and enrolled at the English College in Rheims, France in 1581 before going on to Rome to complete his studies and was ordained. Soon after, he joined the Society of Jesus and was allowed to complete his novitiate in a very short time because of the difficult conditions he would face upon his return to England. Fr Oldcorne stayed with Fr Garnet, the superior of the English Jesuits upon arrival but after a few months he was assigned to Hinlip Hall outside Worcester where he was to spend sixteen years. The master of Hinlip Hall was an ardent Catholic who was in prison and had left the property in the care of his sister, Dorothy, a Protestant who had been at the court of Elizabeth. While priests still found hospitality in Hinlip Hall, she merely tolerated their presence. Many priests had tried to reconcile her to the Church without success. It was left to Fr Oldcorne to find the way. She listened to his instructions and sermons, unconvinced; but when she learned that he had been fasting for days to bring about her conversion, she finally yielded to God’s grace and her conversion led many others in Worcester to return to the faith of their ancestors. The Hall became the Jesuit’s base of operations where many came to seek the sacraments and hear Fr Oldcorne’s preaching. His health was poor ever since he returned to England and he had throat cancer that left him with a hoarse and painful voice, but did not keep him from preaching. His cancer was healed following a pilgrimage to St Winifred’s shrine in 1591. Catholics in England were looking forward to the end of persecution when Queen Elizabeth died and James I ascended the throne in 1603 as he had promised to be more tolerant, but in fact, the persecution increased. This angered some Catholics who plotted to blow up the Houses of Parliament during the king’s visit on Nov 5, 1605. The plot was discovered and with that the hatred for Catholics intensified. The government was determined to implicate the Jesuits in the so-called “Gunpowder Plot” despite the capture of the men behind it. The Jesuit superior Fr Garnet decided to leave London and seek shelter at the Hall, which had more hiding places than any other mansion in England. Bro Nicholas Owen, the person who constructed all the priest-hiding places was with him and they joined Frs Oldcorne and Ashley. The sheriff of Worcestershire and 100 of his men arrived at the Hall and spent several days searching for priests together with a certain Humphrey Littleton who betrayed Fr Oldcorne. The sheriff stationed a man in each room of the house and ordered others to tap on the walls in the hope of locating concealed priest-holes. By the end of the third day they found eleven such hiding places, but no priests, On the fourth day, starvation and thirst forced Br Ashley and Br Owen to emerge from their hole. They had hoped the sheriff would think that he had finally caught his prey and end the search, leaving the two priests in safety. But the sheriff was determined and his men continued their close examination of the house. Finally on the eighth day, Jan 27, 1606 Frs Oldcorne and Garnet were discovered when they emerged white, ill and weak. All four were taken to the Tower of London. When the prison officials failed in their efforts to eavesdrop and record any conversation which could link the two priests to the Gunpowder plot, Fr Oldcorne was tortured on the rack five hours a day for five consecutive days. Yet he refused to say anything. When they were put on trial, Fr Oldcorne denied the charge of being involved so well that the charge against him was changed to simply being a Jesuit priest. On this new charge, Fr Oldcorne was found guilty and ordered to be executed. Just before he was hanged, his betrayer asked for pardon, which Fr Oldcorne readily granted, and he also prayed for the king, his accusers and the judge and jury who condemned him. 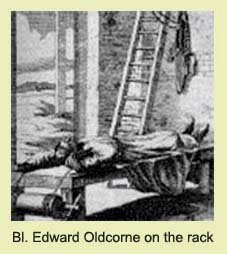 He was pushed from the ladder and was cut down before he was dead and then beheaded and quartered.